As a culture blog, wanted to post this item for those folks who enjoy contemporary art that is NOT on the "ick" side nor the "I could have done that" realm. There might be some "I'm not sure what it is" feelings but they are thoughtful objects and are always well crafted that encourage contemplation and wonder. 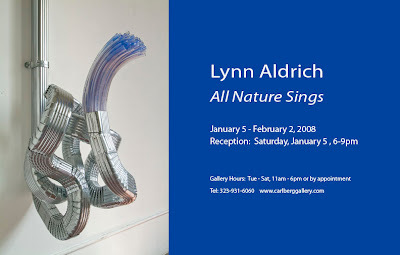 Lynn Aldrich is a friend of mine who works in that space. The exhibit starts Jan 5 and runs until Feb 2, 2008 at the Carl Berg Gallery.